The single release of 'Weeping' is 5:35 while the album version is only 4:51. 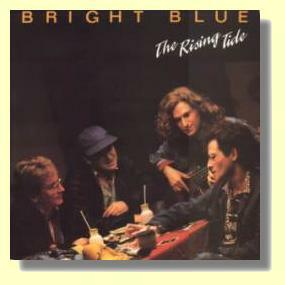 Bright Blue's first album was the training ground for this brilliant album. While the first album is somewhat raw and loose, this is tight, refined and smooth. Obviously 'Weeping' is the highlight of the album (voted the number 1 song of the previous century [on the Amuzine/ SA Rock Digest poll]). It still amazes me that the SABC did not ban it for it's blatant musical reference to N'Kosi Sikelel' iAfrica, let alone for it's political charged lyrics, yet this powerful track reached number 1 on the Radio 5 charts. This is a big song in the same way that Bohemian Rhapsody is big, but without the obscure lyrics. Despite the high praise I have just given to 'Weeping', it is not my personal favourite on the album. I opt for the title track. This song of solidarity with a young man who had refused to to National Military Service and was sentenced to a jail. The words are powerful and the music ebbs and flows on this sublime track. It is similar in feel to 'Weeping', but to my mind just that little bit better. But what of the rest of the album? To say that this pales into insignificance against the the 2 tracks above is probably true, but would be like saying that the rest of the Beatles work pales into insigificance compared to 'Sgt Peppers'. Bright Blue's ability to combine "Western Rock" with the rythms and sounds of South African "Township" music easily equals and generally surpasses Paul Simon's work on 'Graceland'. It is certainly up there with Johnny Clegg (who was the master). While the sound is at times similar to 'Graceland', where Bright Blue have the edge is that their lyrics were politically astute with an insight that Paul Simon could never have. This album probably had it's greatest appeal with young middle class English speaking whites. It said things that a lot of us felt at the time and got away with it in the most tuneful manner. Probably the greatest protest album of the apartheid error (sorry... era). Thanks to Stephen Segerman for loan of original LP.